To help enable our evidence to inform decisions about health we need to both produce highquality, relevant and up-to-date synthesized research evidence (Cochrane Systematic Reviews) and facilitate its use. Cochrane Common Mental Disorders takes our responsibility for getting our evidence used seriously. To do this: we make sure we know who the evidence is for; we ask the right questions; we use the right methods; and, we make our evidence accessible. In this section of our website you can find out more about how we do this and how we use knowledge translation (KT) activites to achieve this. 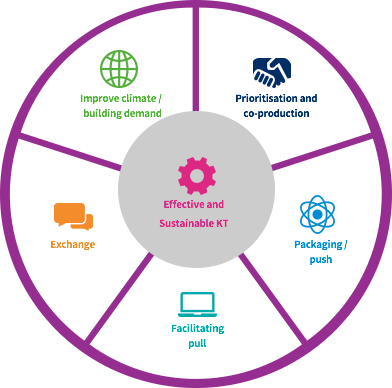 Our KT activites are based on the Cochrane Knowledge Translation Framework, a critical piece of work that helps ensure the evidence we produce is used by the people that need it. The illustration below shows the knowledge translation themes that our activities that fall under. We will use these themes to help explain some of the KT activites we are doing and why. Who is our evidence for?